Happy Pets Multi-Glow Pets are pretty in pink (and blue)! The newest round of limited edition pets has been released in Happy Pets, with CrowdStar offering some new glowing pets to users. These aren't just any glow pets, however, as this new set of six limited edition animals are "multi-glow" pets, meaning that their glowing feature is bigger and better than those seen in previous themes of glowing pets. Basically, each pet now has an outer glowing ring of purple/lavender light, in addition to the color glow you choose to purchase specifically. The six new available options are split evenly between those that are either blue or pink. The blue Multi-Glow pets are the Chicken, Pegazebra (a Pegasus and Zebra combined), and a Cat. For the Chicken and Pegazebra, remember that you'll need to have completed the respective animal holding building before you can purchase them. In this case, you'll need to have completed construction on the Chicken Coop before purchasing the chicken, and the Stable before purchasing the Pegazebra. The pink versions are just as complicated, but offer different choices. In addition to another cat, you can pick up a couple of different animals in the form of a Dragon and a Unicorn. The Unicorn, again, will require the completed construction of a Horse Stable, while the Dragon needs a Dino Den to be built before you can purchase him/her. Depending on the pet you choose, the cost varies, ranging anywhere from 58 Facebook Credits for the Blue Multi-Glow Chicken ($5.80 US) to 66 Facebook Credits for the Dragon, Pegazebra and Unicorn. All of these pets are limited in their quantity in the store, with all of them being available to at least the next 500 users. Still, you'll want to shop fast to get your hands on one of these unique new pets. 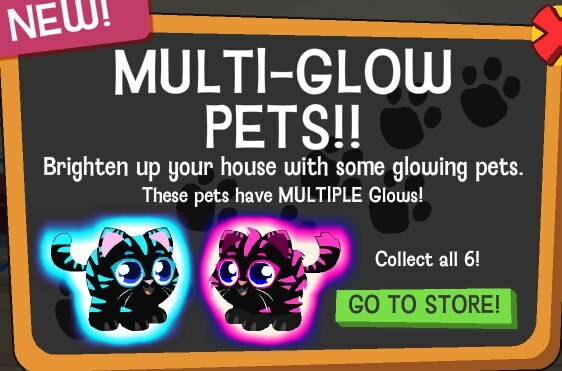 Do you think these Multi-Glow pets are worth the price, or are they really nothing special? Let us know you thoughts on these bright new pets in the comments.